Which cases are suitable for upper removable appliances (URA)? Simple malocclusions where one or more teeth have to be tipped back into their correct position. 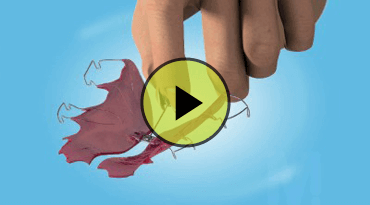 Anyone aged from approximately 7 can wear a removable appliance and the treatment time is approximately 6 to 9 months. However, it must always be borne in mind that success of treatment depends on patient compliance. What are URAs used for? To tip teeth into the required position. 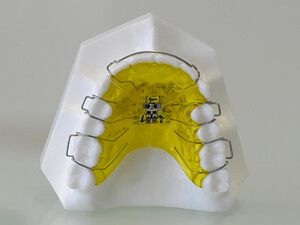 An acrylic baseplate (supports the wire components and helps provide anchorage through contact with the palatal vault). Clasps or Adams cribs (aid retention). Springs (move teeth in a specific direction). Screws (aid expansion of arch and move the teeth labially). You need to be sure of how to remove and replace the appliance correctly. 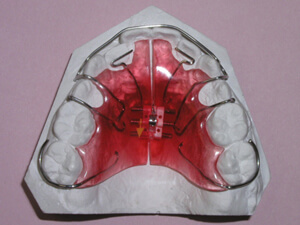 The appliance must be adjusted as recommended by the orthodontist to ensure progress is made. Discomfort is normal for the first few days after the appliance has been fitted and getting used to having the appliance in the mouth may take a few weeks. The appliance must be worn as advised by the orthodontist and only removed when cleaning or participating in contact sports. You should place the appliance into a retainer box immediately after removing it from your mouth so as to avoid the appliance getting damaged or lost. Appliances should be cleaned at least twice a day. This can be done by using a soft tooth brush and toothpaste to remove any debris (you should fill the sink with cold water to avoid breakage in case you drop the appliance) You can also use a solution of Retainer Brite to disinfect it every two days. After the disclosing tablets have been chewed, teeth must be brushed again to clean any remaining stained plaque areas and the mouth thoroughly rinsed with mouthwash. Avoid eating certain foods: namely sticky, hard and very sweet substances as well as chewing gum. These foods can cause damage to the braces or stick to the brace, and a decaying process may start. Avoid fizzy and acidic drinks. This includes too many soft drinks and fruit juices. Drinking fizzy and acidic liquids cause permanent loss of tooth enamel. Water is the best! The appliance MUST NOT be clicked in and out! This will loosen the appliance and it may eventually break resulting in prolonged treatment times. Throughout my treatment, WO always kept me informed about what they were doing and why they were doing it. They were also honest about the timescale of the treatment from the very start, which turned out to be shorter than first expected!